Nitrocellulose (also known as cellulose nitrate, flash paper, flash cotton, guncotton, and flash string) is a highly flammable compound formed by nitrating cellulose through exposure to nitric acid or another powerful nitrating agent. When used as a propellant or low-order explosive, it was originally known as guncotton. Partially nitrated cellulose has found uses as a plastic film and in inks and wood coatings. In 1855, the first man-made plastic, nitrocellulose (branded Parkesine, patented in 1862), was created by Alexander Parkes from cellulose treated with nitric acid and a solvent. In 1868, American inventor John Wesley Hyatt developed a plastic material he named Celluloid, improving on Parkes' invention by plasticizing the nitrocellulose with camphor so it could be processed into finished form and used as a photographic film. Celluloid was used by Kodak, and other suppliers, from the late 1880s as a film base in photography, X-ray films, and motion-picture films, and was known as nitrate film. After numerous fires caused by unstable nitrate films, "safety film" (cellulose acetate film) started to be used from the 1930s in the case of X-ray stock and from 1948 for motion-picture film. An M13 rocket for the Katyusha launcher on display in the Musée de l'Armée: Its solid-fuel rocket motor was prepared from nitrocellulose. Henri Braconnot discovered in 1832 that nitric acid, when combined with starch or wood fibers, would produce a lightweight combustible explosive material, which he named xyloïdine. A few years later in 1838, another French chemist, Théophile-Jules Pelouze (teacher of Ascanio Sobrero and Alfred Nobel), treated paper and cardboard in the same way. Jean-Baptiste Dumas obtained a similar material, which he called nitramidine. These substances were highly unstable and were not practical explosives. However, around 1846 Christian Friedrich Schönbein, a German-Swiss chemist, discovered a more practical solution. 2. The reaction is first order and proceeds by electrophilic substitution at the C−OH centers of the cellulose. Deflagration test of nitrocellulose in slow motion. Guncotton is made by treating cotton (used as the source of cellulose) with concentrated sulfuric acid and 70% nitric acid[clarification needed] cooled to 0 °C to produce cellulose trinitrate. While guncotton is dangerous to store, the hazards it presents can be reduced by storing it dampened with various liquids, such as alcohol. For this reason, accounts of guncotton usage dating from the early 20th century refer to "wet guncotton". The power of guncotton made it suitable for blasting. As a projectile driver, it had around six times the gas generation of an equal volume of black powder and produced less smoke and less heating. The patent rights for the manufacture of guncotton were obtained by John Hall & Son in 1846, and industrial manufacture of the explosive began at a purpose-built factory at Marsh Works in Faversham, Kent, a year later. However, the manufacturing process was not properly understood and few safety measures were put in place. A serious explosion in July of that year killed almost two dozen workers, resulting in the immediate closure of the plant. Guncotton manufacture ceased for over 15 years until a safer procedure could be developed. Further research indicated the importance of very careful washing of the acidified cotton. Unwashed nitrocellulose (sometimes called pyrocellulose) may spontaneously ignite and explode at room temperature, as the evaporation of water results in the concentration of unreacted acid. The British chemist Frederick Augustus Abel developed the first safe process for guncotton manufacture, which he patented in 1865. The washing and drying times of the nitrocellulose were both extended to 48 hours and repeated eight times over. The acid mixture was changed to two parts sulfuric acid to one part nitric. Nitration can be controlled by adjusting acid concentrations and reaction temperature. Nitrocellulose is soluble in a mixture of alcohol and ether until nitrogen concentration exceeds 12%. Soluble nitrocellulose, or a solution thereof, is sometimes called collodion. Guncotton containing more than 13% nitrogen (sometimes called insoluble nitrocellulose) was prepared by prolonged exposure to hot, concentrated acids for limited use as a blasting explosive or for warheads of underwater weapons such as naval mines and torpedoes. Safe and sustained production of guncotton began at the Waltham Abbey Royal Gunpowder Mills in the 1860s, and the material rapidly became the dominant explosive, becoming the standard for military warheads, although it remained too potent to be used as a propellant. More-stable and slower-burning collodion mixtures were eventually prepared using less-concentrated acids at lower temperatures for smokeless powder in firearms. The first practical smokeless powder made from nitrocellulose, for firearms and artillery ammunition, was invented by French chemist Paul Vieille in 1884. Jules Verne viewed the development of guncotton with optimism. He referred to the substance several times in his novels. His adventurers carried firearms employing this substance. The most noteworthy reference is in his From the Earth to the Moon, in which guncotton was used to launch a projectile into space. On May 2, 1887, Hannibal Goodwin filed a patent for "a photographic pellicle and process of producing same ... especially in connection with roller cameras", but the patent was not granted until September 13, 1898. In the meantime, George Eastman had already started production of roll-film using his own process. Nitrocellulose was used as the first flexible film base, beginning with Eastman Kodak products in August, 1889. Camphor is used as a plasticizer for nitrocellulose film, often called nitrate film. Goodwin's patent was sold to Ansco, which successfully sued Eastman Kodak for infringement of the patent and was awarded $5,000,000 in 1914 to Goodwin Film. Nitrate film was used for X-ray photography for some time, where its flammability hazard was most acute, thus in 1933, became disused for such purposes, along with its uses for motion-picture films in 1951, where it was replaced by safety film with an acetate base. Nitrocellulose X-ray film ignition was the cause behind the Cleveland Clinic fire of 1929 in Cleveland, Ohio, which claimed the lives of 123 people during the fire, and a number who were rescued, but died several days later due to inhalation of the toxic smoke. The use of nitrocellulose film for motion pictures led to the requirement for fireproof projection rooms with wall coverings made of asbestos. A training film for projectionists included footage of a controlled ignition of a reel of nitrate film, which continued to burn when fully submerged in water. Unlike many other flammable materials, nitrocellulose does not need air to keep burning, as the material contains sufficient oxygen within its molecular structure. Once burning, it is extremely difficult to extinguish. Immersing burning film in water may not extinguish it, and could actually increase the amount of smoke produced. Owing to public safety precautions, the London Underground forbade transport of movies on its system until well past the introduction of safety film. Cinema fires caused by ignition of nitrocellulose film stock were the cause of the 1926 Dromcolliher cinema tragedy in County Limerick in which 48 people died and the 1929 Glen Cinema disaster in Paisley, Scotland, which killed 69 children. Today, nitrate film projection is normally highly regulated and requires extensive precautionary measures including extra projectionist health and safety training. Projectors certified to run nitrate films have many precautions, among them the chambering of the feed and takeup reels in thick metal covers with small slits to allow the film to run through. The projector is modified to accommodate several fire extinguishers with nozzles aimed at the film gate. The extinguishers automatically trigger if a piece of flammable fabric placed near the gate starts to burn. While this triggering would likely damage or destroy a significant portion of the projection components, it would prevent a fire which could cause far greater damage. Projection rooms may be required to have automatic metal covers for the projection windows, preventing the spread of fire to the auditorium. The Dryden Theatre at the George Eastman Museum is one of a few theaters in the world that is capable of safely projecting nitrate films, and regularly screens films to the public. 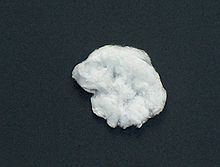 Nitrocellulose was found to gradually decompose, releasing nitric acid and further catalyzing the decomposition (eventually into a flammable powder). Decades later, storage at low temperatures was discovered as a means of delaying these reactions indefinitely. The great majority of films produced during the early 20th century are thought to have been lost either through this accelerating, self-catalyzed disintegration or through studio warehouse fires. Salvaging old films is a major problem for film archivists (see film preservation). Nitrocellulose film base manufactured by Kodak can be identified by the presence of the word 'nitrate' in dark letters along one edge; the word only in clear letters on a dark background indicates derivation from a nitrate base original negative or projection print, but the film in hand itself may be a later print or copy negative, made on safety film. Acetate film manufactured during the era when nitrate films were still in use was marked 'Safety' or 'Safety Film' along one edge in dark letters. 8, 9.5, and 16 mm film stocks, intended for amateur and other nontheatrical use, were never manufactured with a nitrate base in the west, but rumors exist of 16 mm nitrate film having been produced in the former Soviet Union and/or China. Cellulose is treated with sulfuric acid and potassium nitrate to give cellulose mononitrate. This was used commercially as 'celluloid', a highly flammable plastic used in the first half of the 20th century for lacquers and photographic film. Nitrate dominated the market for professional-use 35 mm motion picture film from the industry's origins to the early 1950s. While cellulose acetate-based so-called "safety film", notably cellulose diacetate and cellulose acetate propionate, was produced in the gauge for small-scale use in niche applications (such as printing advertisements and other short films to enable them to be sent through the mails without the need for fire safety precautions), the early generations of safety film base had two major disadvantages relative to nitrate: it was much more expensive to manufacture, and considerably less durable in repeated projection. The cost of the safety precautions associated with the use of nitrate was significantly lower than the cost of using any of the safety bases available before 1948. These drawbacks were eventually overcome with the launch of cellulose triacetate base film by Eastman Kodak in 1948. Cellulose triacetate superseded nitrate as the film industry's mainstay base very quickly. While Kodak had discontinued some nitrate film stocks earlier, they stopped producing various nitrate roll films in 1950 and ceased production of nitrate 35 mm motion picture film in 1951. The crucial advantage cellulose triacetate had over nitrate was that it was no more of a fire risk than paper (the stock is often referred to as "non-flam": this is true—but it is combustible, just not in as volatile or as dangerous a way as nitrate), while it almost matched the cost and durability of nitrate. It remained in almost exclusive use in all film gauges until the 1980s, when polyester/PET film began to supersede it for intermediate and release printing. Polyester is much more resistant to polymer degradation than either nitrate or triacetate. Although triacetate does not decompose in as dangerous a way as nitrate does, it is still subject to a process known as deacetylation, often nicknamed "vinegar syndrome" (due to the acetic acid smell of decomposing film) by archivists, which causes the film to shrink, deform, become brittle and eventually unusable. PET, like cellulose mononitrate, is less prone to stretching than other available plastics. By the late 1990s, polyester had almost entirely superseded triacetate for the production of intermediate elements and release prints. Triacetate remains in use for most camera negative stocks because it can be "invisibly" spliced using solvents during negative assembly, while polyester film can only be spliced using adhesive tape patches or ultrasonically, both of which leave visible marks in the frame area. Also, polyester film is so strong, it will not break under tension and may cause serious damage to expensive camera or projector mechanisms in the event of a film jam, whereas triacetate film breaks easily, reducing the risk of damage. Many were opposed to the use of polyester for release prints for precisely this reason, and because ultrasonic splicers are very expensive items, beyond the budgets of many smaller theaters. In practice, though, this has not proved to be as much of a problem as was feared. Rather, with the increased use of automated long-play systems in cinemas, the greater strength of polyester has been a significant advantage in lessening the risk of a film performance being interrupted by a film break. Despite its self-oxidizing hazards, nitrate is still regarded highly as the stock is more transparent than replacement stocks, and older films used denser silver in the emulsion. The combination results in a notably more luminous image with a high contrast ratio. A nitrocellulose slide, nitrocellulose membrane, or nitrocellulose paper is a sticky membrane used for immobilizing nucleic acids in southern blots and northern blots. It is also used for immobilization of proteins in western blots and atomic force microscopy for its nonspecific affinity for amino acids. Nitrocellulose is widely used as support in diagnostic tests where antigen-antibody binding occurs, e.g., pregnancy tests, U-albumin tests and CRP. Glycine and chloride ions make protein transfer more efficient. In 1846, nitrated cellulose was found to be soluble in ether and alcohol. The solution was named collodion and was soon used as a dressing for wounds. It is still in use today in topical skin applications, such as liquid skin and in the application of salicylic acid, the active ingredient in Compound W wart remover. Adolph Noé developed a method of peeling coal balls using nitrocellulose. In 1851, Frederick Scott Archer invented the wet collodion process as a replacement for albumen in early photographic emulsions, binding light-sensitive silver halides to a glass plate. Magicians' flash papers are sheets of paper or cloth made from nitrocellulose, which burn almost instantly with a bright flash, leaving no ash. As a medium for cryptographic one-time pads, they make the disposal of the pad complete, secure, and efficient. Radon tests for alpha track etches use it. For space flight, nitrocellulose was used by Copenhagen Suborbitals on several missions as a means of jettisoning components of the rocket/space capsule and deploying recovery systems. However, after several missions and flights, it proved not to have the desired explosive properties in a near vacuum environment. Nitrocellulose lacquer was used as a finish on guitars and saxophones for most of the 20th century and is still used on some current applications. Manufactured by (among others) DuPont, the paint was also used on automobiles sharing the same color codes as many guitars including Fender and Gibson brands, although it fell out of favor for a number of reasons: pollution, and the way the lacquer yellows and cracks over time. Nitrocellulose lacquer was also used as an aircraft dope, painted onto fabric-covered aircraft to tighten and provide protection to the material, but has been largely superseded by alternative cellulosics and other materials. It is used to coat playing cards and to hold staples together in office staplers. Nail polish is made from nitrocellulose lacquer as it is inexpensive, dries quickly, and is not damaging to skin. Nitrocellulose lacquer is spin-coated onto aluminum or glass discs, then a groove is cut with a lathe, to make one-off phonograph records, used as masters for pressing or for play in dance clubs. They are referred to as acetate discs. Depending on the manufacturing process, nitrocellulose is esterified to varying degrees. Table tennis balls, guitar picks, and some photographic films have fairly low esterification levels and burn comparatively slowly with some charred residue. Guncotton, dissolved at about 25% in acetone, forms a lacquer used in preliminary stages of wood finishing to develop a hard finish with a deep lustre. It is normally the first coat applied, sanded and followed by other coatings that bond to it. Because of its explosive nature, not all applications of nitrocellulose were successful. In 1869, with elephants having been poached to near extinction, the billiards industry offered a US$10,000 prize to whomever came up with the best replacement for ivory billiard balls. John Wesley Hyatt created the winning replacement, which he created with a new material he invented called camphored nitrocellulose—the first thermoplastic, better known as celluloid. The invention enjoyed a brief popularity, but the Hyatt balls were extremely flammable, and sometimes portions of the outer shell would explode upon impact. An owner of a billiard saloon in Colorado wrote to Hyatt about the explosive tendencies, saying that he did not mind very much personally but for the fact that every man in his saloon immediately pulled a gun at the sound. The process used by Hyatt to manufacture the billiard balls, patented in 1881, involved placing the mass of nitrocellulose in a rubber bag, which was then placed in a cylinder of liquid and heated. Pressure was applied to the liquid in the cylinder, which resulted in a uniform compression on the nitrocellulose mass, compressing it into a uniform sphere as the heat vaporized the solvents. The ball was then cooled and turned to make a uniform sphere. In light of the explosive results, this process was called the "Hyatt gun method". 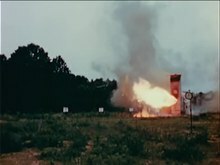 'United States Inter-Agency Committee for Nitrate Film Vault Tests' - film transfer from 1948 about testing storage and flame suppression methods of nitrate film stock. Collodion, a solution of nitrocellulose in ether and ethanol, is a flammable liquid. When dry, nitrocellulose is explosive and can be ignited with heat, spark, or friction. An overheated container of dry nitrocellulose is believed to be the initial cause of the 2015 Tianjin explosions. ^ Merck Index (11th ed.). p. 8022. ^ Pelouze, Théophile-Jules (1838). "Sur les produits de l'action de l'acide nitrique concentré sur l'amidon et le ligneux" [On the products of the action of concentrated nitric acid on starch and wood]. Comptes Rendus. 7: 713–715. Schönbein, Christian Friedrich (1846-03-11). "Notiz über eine Veränderung der Pflanzenfaser und einiger andern organischen Substanzen" [Notice on a change of plant fibers and some other organic substances]. Bericht über die Verhandlungen der Naturforschenden Gesellschaft in Basel. 7: 26–27. Schönbein, Christian Friedrich (1846-05-27). "Ueber Schiesswolle" [On guncotton]. Bericht über die Verhandlungen der Naturforschenden Gesellschaft in Basel. 7: 27. Schönbein, Christian Friedrich (1846). "Lettre de M. Schoenbein à M. Dumas". Comptes Rendus. 23: 678–679. ^ Itzehoer Wochenblatt, 29 October 1846, col. 1626ff. ^ Urbanski, Tadeusz (1965). Chemistry and Technology of Explosives. 1. Oxford: Pergamon Press. pp. 20–21. ^ Ponting, Clive (2011). Gunpowder: An Explosive History – from the Alchemists of China to the Battlefields of Europe. Random House. ISBN 9781448128112. ^ a b Fairfield, A. P.; CDR USN (1921). Naval Ordnance. Lord Baltimore Press. pp. 28–31. ^ a b Brown, G. I. (1998). The Big Bang: A History of Explosives. Sutton Publishing. p. 132. ISBN 978-0-7509-1878-7. ^ Clifton, Brad. "The Cleveland Clinic X-Ray Fire of 1929". Cleveland Historical. Retrieved 2015-04-01. ^ Kermode, Mark (May 1, 2012). The Good, the Bad and the Multiplex. Random House. p. 3. ISBN 9780099543497. ^ "Nitrate Film: If It Hasn't Gone Away, It's Still Here!". Pro-Tek Vaults. 2015-06-04. Retrieved 11 March 2016. ^ "About the Dryden Theatre". George Eastman Museum. Retrieved 11 March 2016. ^ Cleveland, David (2002). "Don't Try This at Home: Some Thoughts on Nitrate Film, With Particular Reference to Home Movie Systems". In Smither, Roger; Surowiec, Catherine (eds.). This Film is Dangerous: A Celebration of Nitrate Film. Brussels: FIAF. p. 196. ISBN 978-2-9600296-0-4. ^ Fordyce, Charles; et al. (Oct 1948). "Improved Safety Motion Picture Film Support". Journal of the SMPE. 51 (4): 331–350. doi:10.5594/j11731. ^ Shanebrook, Robert L. (2016). Making Kodak Film (Expanded 2nd ed.). Rochester, NY: Robert L. Shanebrook. p. 82. ISBN 978-0-615-41825-4. ^ Van Schil, George J. (Feb 1980). "The Use of Polyester Film Base in the Motion Picture Industry". SMPTE Journal. 89 (2): 106–110. doi:10.5594/j00526. ^ Case, Jared. "Art Talk: The Nitrate Picture Show". Retrieved 10 March 2015. ^ Kreplak, L.; et al. (2007). "Atomic Force Microscopy of Mammalian Urothelial Surface". Journal of Molecular Biology. 374 (2): 365–373. doi:10.1016/j.jmb.2007.09.040. PMC 2096708. PMID 17936789. ^ Schönbein, C. F. (1849). "On ether glue or liquor constringens; and its uses in surgery". The Lancet. 1 (1333): 289–290. doi:10.1016/s0140-6736(02)66777-7. ^ Maynard, John Parker (1848). "Discovery and application of the new liquid adhesive plaster". The Boston Medical and Surgical Journal. 38 (9): 178–183. doi:10.1056/nejm184803290380903. ^ Kraus, E. J. (September 1939). "Adolf Carl Noe". Botanical Gazette. 101 (1): 231. doi:10.1086/334861. JSTOR 2472034. ^ Leggat, R. "The Collodion Process". A History of Photography. ^ "In Space No One Can Hear your Nitrocellulose Explode". Wired. 2013-10-21. ^ "What is "stand damage"?". Archived from the original on 2008-03-30. Retrieved 2008-01-15. ^ United States. National Resources Committee (1941). Research: A National Resource. USGPO. p. 29. ^ Worden, Edward Chauncey (1911). Nitrocellulose Industry. 2. D. Van Nostrand Company. pp. 726–727. ^ a b "Hazardous Substance Fact Sheet: Nitrocellulose" (PDF). New Jersey Department of Health. Wikimedia Commons has media related to Nitrocellulose. This page was last edited on 19 April 2019, at 15:56 (UTC).